_New London, founded in 1646 by John Winthrop, Jr., became an important port in colonial America because of its protected harbor at the mouth of the Thames River. In 1834, over 30 ships and 900 men from New London were employed in whaling. By the middle of the 1800s, New London was America's third leading whaling port, behind New Bedford and Nantucket. An early beacon of some kind was reportedly erected around 1750 at the harbor's entrance, but it soon became apparent that a more permanent lighthouse was needed. A 64-foot stone tower with a wooden lantern was erected at the west side of the harbor entrance in 1761, paid for by money raised by selling lottery tickets. _The land for the lighthouse was bought from the merchant Nathaniel Shaw, Jr.
New London Harbor Light was the fourth lighthouse in North America and the first on Long Island Sound. A tax on local shipping helped pay for the upkeep of the tower. The lighthouse made it through the American Revolution unscathed, helping to guide American privateers into New London Harbor. In 1791, President George Washington signed legislation authorizing the expenditure of $360 quarterly to supply New London Harbor Light's six lamps with spermaceti oil. The lighthouse developed a large crack by 1799, and there were numerous complaints that the light was difficult to distinguish from neighboring homes. It was part of the inheritance of his wife, Lucretia, the only child of Daniel Harris. The prominent Harris family had lived on the land since the earliest days of the settlement of New London. _In 1801 a new 89-foot stone lighthouse with a cast-iron lantern was completed by Abisha Woodward of New London. _An oil house and cistern building were also built at a total cost of $15,547. The handsome octagonal brownstone tower still stands and is the oldest existing lighthouse in Connecticut. An 1802 letter recommended that the salary of the keeper be raised from $200 yearly, at which it had remained for many years, because, "the Lighthouse has been made much higher, the light augmented, the machinery of the eclipser to be kept in order..."
New London Harbor Light was one of the earliest American lighthouses with a flashing light. The revolving eclipser gave it a distinct characteristic so it couldn't be confused with the lights of nearby houses. It is situated on a rocky point to the westward of the entrance to the river Thames, and is two miles from the town of New London; it is of great importance as a leading light for vessels going in and out of the harbor of New London, which, on account of its position and security, is much resorted to during the heavy gales of winter. The tower is a substantial building of freestone, smooth hammered, and laid in courses; it is 80 feet in height, and is ascended by an interior stairway of wood... The lighting apparatus consists of 11 lamps, with parabolic reflectors, disposed around two horizontal tables... This apparatus was furnished in 1834, and is now in very good order... The light-keeper covers the ordinary wicks with small pieces of cotton cloth, which he thinks increases the consumption of oil, and causes the lamps to give a brighter light. The lighthouse's lamps and reflectors were replaced by a fourth order Fresnel lens in 1857, and the lens remains in use today. 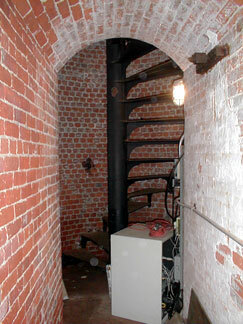 Many experiments with fog signals were carried out at New London Harbor Light. A second-class Daboll trumpet was installed in 1874, operated by a hot-air engine. In 1883 a new first-class fog signal was installed, and in 1896 new engines and air compressors were added. In 1904 a new fog siren provoked complaints from the local summer residents. One man exclaimed, "How about that horrible shrieking and groaning siren that has been stuck up on top of the lighthouse here? Unless something is done pretty soon, this will be the best field of practice for a specialist of nervous disease that I know of." The mayor of New London was among 75 citizens who signed a petition for the removal of the signal. A compromise was reached when a less objectionable trumpet replaced the siren. In 1911 the fog signal was relocated to the New London Ledge Light. _The keeper [Charles B. Field], a Swede, was a very intelligent man; curious to relate, he was a connoisseur in violins, about which he told me a great deal and tried to tell me more; but I wanted to know of other things -- the sea and ships. When we were in the tower talking of fog, he told me how one night, when he was operating the horn, and 'the fog was so thick yer could have cut it with a knife and it fairly stuck in yer throat,' suddenly the sound seemed to strike something and reverberate with a strange echo against the lighthouse. Instinct told him that this was caused by the sails of some ship quite near by and in immediate danger of running on the rocks. He shouted a warning to the invisible ship, and between the blasts of the horn surely enough there came back an answer. He had altered the vessel's course just in time. _In April 2005, it was announced that ownership of the lighthouse would be transferred to the New London Maritime Society under the provisions of the National Historic Lighthouse Preservation Act of 2000. The society also operates the Custom House Maritime Museum, and promotes the maritime history of New London through its collections, library, archives, museum exhibits, and educational programs. The New London Maritime Society's ownership of the lighthouse became official in 2009, and the formal conveyance took place on October 13, 2010. The retaining walls near the tower were damaged by Hurricane Sandy in October 2012. Funds raised by the New London Maritime Society enabled the repair of the walls. In late May 2014, 60 volunteers from a local carpenters' union erected donated scaffolding around the lighthouse tower in preparation for cleaning, repointing, and painting. The scaffolding was donated by Brand Energy and Infrastructure Services. The painting is to be performed by members of Painters Local 1122. _New London Harbor Light can be seen from Pequot Avenue, but the grounds are not open to the public. It is possible to arrange a tour of the lighthouse through the New London Maritime Society; call 860-447-2501. The Society also offers lighthouse boat tours in summer; call or check their website for details. _Excellent views can be obtained from many of the vessels leaving New London, including ferries to Fishers Island, Block Island, and Montauk, Long Island. Venerable New London Harbor Light remains an active aid to navigation, with a fixed white light and a red sector warning mariners away from dangerous Sarah Ledge.